All Saints, Newby Place, Poplar, London E14. History of All Saints, Poplar. 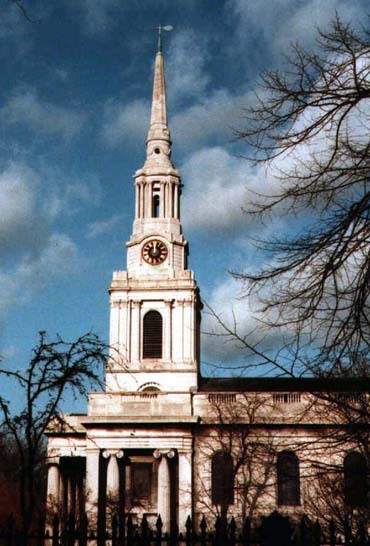 The church was consecrated on July 3rd 1823 as the parish church of the newly created parish of Poplar – it had been separated from the parish of Stepney in 1817. The church was built at a total cost of £33,000 following an architectural competition in 1820 which attracted 36 entries. It was funded largely from the parish rates and by loans from shipbuilder George Green and John Stock, a magistrate and schoolmaster. When building was completed the loans were taken over by the West India Dock Company which, as the major ratepayer, had insisted that it’s engineer John Rennie and Architect George Dance should adjudicate on the six short listed competition entries. There is some mystery over the, identity of the Architect. Charles Hollis, the man to whom the design is attributed was a little known Architect: apart from a church and a bridge at Windsor he does not seem to have carried out much public work, It has been claimed on more than one occasion that All Saints was the work of Joseph Scoles, a Roman Catholic, and in those more religiously bigotted days, ineligible to participate in a competition to design an Anglican church. Is said that the design for All Saints was exhibited subsequently under his name at the Royal Academy. However there is no puzzle over who built the church. That was local builder Thomas Morris, who is buried in the churchyard. The stone-faced church has a traditional Georgian design in the style established by James Gibbs, architect of St. Martin in the Fields when it was rebuilt between 1722 and1726. St. Martin’s became the model for many 18th century churches both in England and America. Gibbs also designed St. Mary-le-Strand and a new steeple for St. Clement Danes. Thus All Saints has a tower at the West end sat behind a large portico. No cost was spared in the finishing touches. The churchyard and rectory garden were surrounded by ornate cast iron railings set on a granite base which, at a cost of £3,649, were slightly more expensive than the Rectory – that cost £3,635 1s. 1 d – very large sums of money for that time despite the inflation caused by the Napoleonic Wars. The architectural fee was £1,663. All this was included in the £33,000 total. The bells, cast by the Whitechapel Bell Foundry in 1822, are considered to be one of the finest rings of ten in London. The bells were re-hung in a new cast iron and steel H frame by Taylor’s of Loughborough in 1926. There is also an organ by Hunter which came from a south London church bombed during the last war. It was rebuilt and installed in All Saints by Manders of Bethnal Green in 1953. When bomb damage was repaired. During the war the church vaults served as air raid shelters. The church suffered blast damage from a rocket bomb, while a drifting barrage balloon pulled the steeple out of a true line. In 1984-5 a restoration programme funded by the London Docklands Development Corporation included the cleaning and repair of the exterior of the whole building.